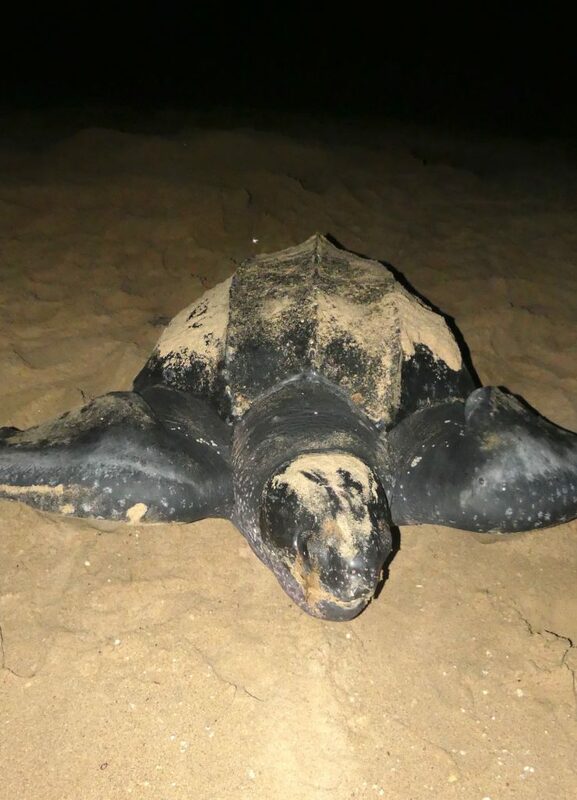 The Leatherback sea turtle is the biggest and one of the rarest of all sea turtles. Threatened by activities like commercial fishing and pollution, there are only 34,000-36,000 left in the wild, so catching a glimpse of these giant turtles can be a once in a lifetime opportunity and a breathtaking sight. During my January 2019 trip to Southern Africa, I was lucky enough to witness one of these amazing creatures on land, laying her eggs. Driving down the beach with lightning in the distance, the sky was lit with stars so bright that the Milky Way was as easy to spot as Orion’s Belt. Doing our best to stay awake in the cruiser, we watched the hundreds of ghost crabs dancing towards the water, just escaping the cars wheels. Our driver stopped after about an hour drive as he spotted the first set of sea turtle tracks, about four feet wide. A loggerhead sea turtle’s track! We all piled out of the car, excited for our first view. We saw her just as she was finishing covering up her nest. After a sea turtle lays her eggs, she will move sand to both fill in her nest and camouflage it from predators such as snakes and birds. After she was satisfied her nest would not be found, we watched her make her way back to the sea in a timely fashion, and then she was gone. Getting back into the car, our guide gave us the option to turn back and head to camp or continue up the beach for the remaining distance guides are allowed to go. We decided to keep moving forward, as it was only 11:30pm. We drove for another ten minutes when suddenly our driver hopped out of the car and ran towards the edge of the beach. Most of us were half asleep at this point, dreading our early wake up call, when our guide came running back to us, giddier than a kid in a candy shop. 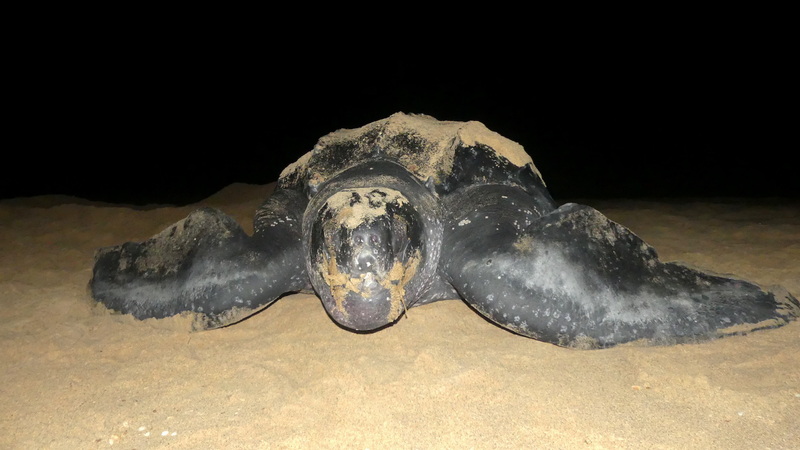 We all jumped out of the car, shoes forgotten on the ground, as our guide whisper-yelled that he found a leatherback. This was his first sighting as well. 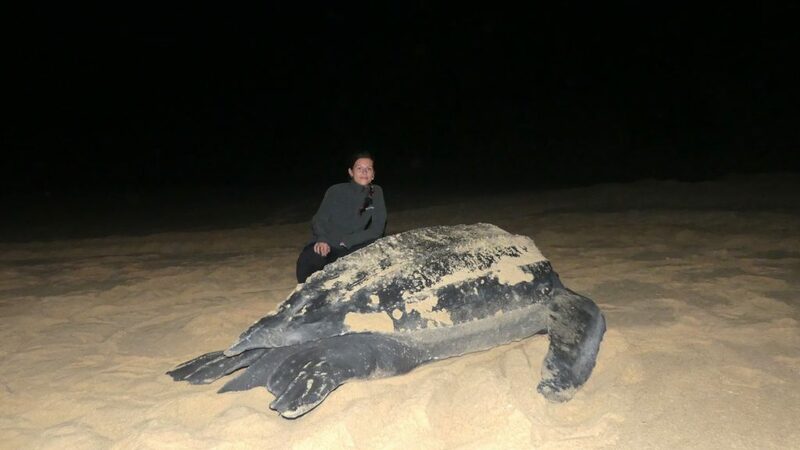 As someone that loves sea turtles, I always knew the leatherback sea turtle was the largest species, yet standing next to this giant in person was remarkable. She was about six feet by six feet, meticulously digging a hole for her eggs using one back flipper at a time. We found her at the perfect time, just minutes before she started to lay her eggs. 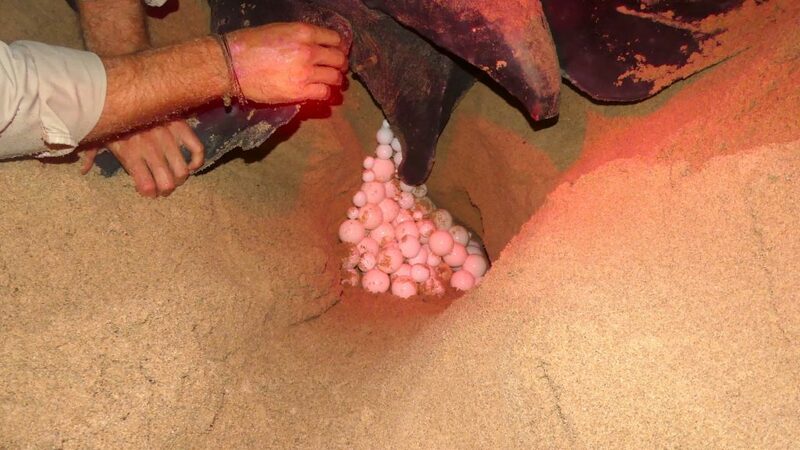 The laying process lasted for about 15 to 20 minutes, with hundreds of eggs of all different sizes. 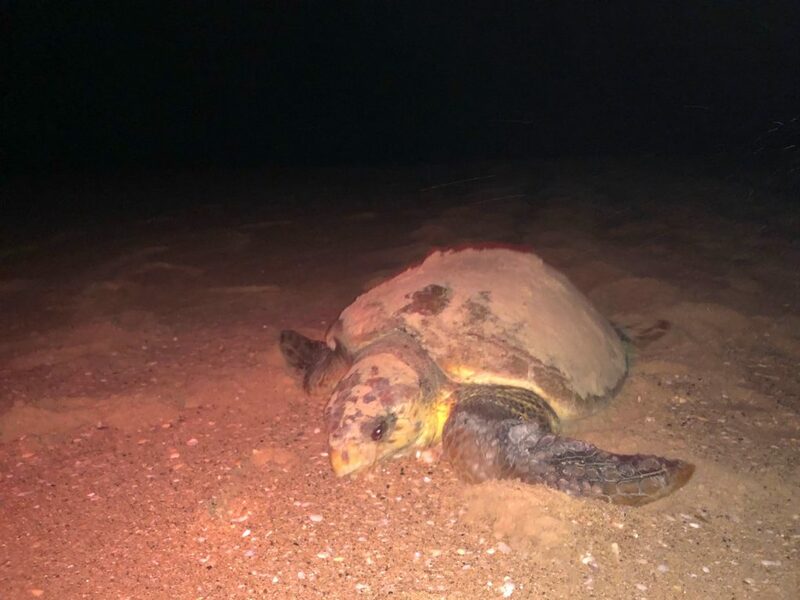 When a sea turtle is laying her eggs, she goes into a trance-like state and a human is actually able to touch her or move her without her knowing. However, as guests during this sighting, we kept a respectful distance, taking in the amazing view that was hard to comprehend. We took our seats in the sand just feet away from her and watched as she began to move sand with all of her flippers. At first, I questioned what exactly she was doing as it looked like she was making it painfully obvious where she just laid her eggs. Each time she would move her giant flippers, she would hit the sand with a thump you could feel in your chest and slowly push sand, creating a circle around her. After an hour or so of watching her, her plan became clear. She had covered her nest and was making a completely new and identical site away from the eggs, perfect for tricking predators into thinking the eggs would be hidden there. Finally, she was ready to return to the sea. We walked along with her as she moved slowly towards the tide, using the white reflection of the moon on the waves to guide her. Seeing her fully stretched out and moving was even more shocking, as I am 5’3 and she was much, much bigger. After spending about two hours with her, I was sad to see her disappear into the dark waves. Yet as it was 2am, I was happy to get back to camp for as much sleep as I could get before morning. This experience is completely unique and perfect for any and every traveler. Being able to be so close to this amazing animal is a memory I’ll never forget.